Don't Take a Vacation From Oral Hygiene This Summer! How Do We Make Your Dental Implants Look So Good? When Should You See A Periodontist? What Won't Florence Henderson Leave Home Without? Snoring & Sleep Apnea — Are You At Risk? When your mouth is dry, you know it: that sticky, uncomfortable feeling when you first wake up or when you're thirsty. Fortunately, it usually goes away after you eat or drink. But what if your mouth felt like that all the time? Then, it's no longer an irritation—chronic dry mouth could also increase your risk of dental disease. 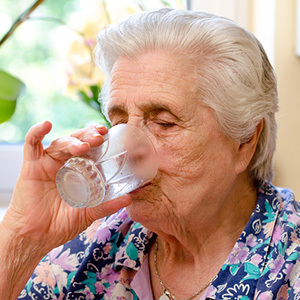 Chronic dry mouth occurs because of inadequate saliva flow. Saliva plays an important role in preventing dental disease because it neutralizes acid, which can cause the mineral content in tooth enamel to break down and lead to tooth decay. The mouth becomes more acidic right after eating, but saliva can restore its normal pH levels in about an hour—as well as some of the enamel's lost mineral content. Without saliva, your tooth enamel is at greater risk from acid. While a number of things can potentially interfere with normal saliva production, medication is the most common. More than 500 prescription drugs, including many antihistamines, diuretics or antidepressants, can cause dry mouth. Cancer radiation or chemotherapy treatment and certain metabolic conditions like diabetes or Parkinson's disease can also increase symptoms. If you are experiencing unusual dry mouth symptoms, see your dentist first for a full examination. Your dentist can measure your saliva flow, check your prescriptions and medical history, and examine your salivary glands for abnormalities. With this more accurate picture of your condition, they can help direct you to the most effective remedies and treatments for the cause. If medication is the problem, you can talk to your doctor about alternative prescriptions that have a lesser effect on saliva flow. You can also drink more water before and after taking oral medication and throughout the day to help lubricate your mouth. Chewing gums or mints with xylitol, a natural alcohol sugar, can also help: xylitol helps reduce the mouth's bacterial levels, as well as stimulate saliva flow. Easing your dry mouth symptoms can make your life more pleasant. More importantly, it can reduce your risk of future dental problems caused by a lack of saliva. We encourage you to contact us whenever you have an interest about our services.